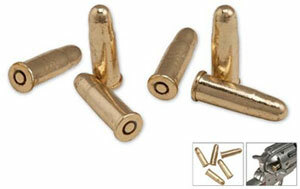 These brass finish cartridges are made to fit the Civil War style replicas. They are solid metal castings and cannot be made to fire. Each set includes six pieces that are 1/4" in diameter and are 1 1/4" overall.